The Nautican Princes are trained and nurtured from early age to turn them into true leaders of their people. They are honourable, tactically aware and have the admiration of all Nautica. May choose up to 50 pts or magic items from the Common or Nautican magic items list. 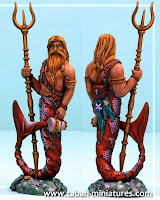 Battle Standard Bearer - if the army does not include a Chanty Singer* then one Nautican Prince can carry the Battle Standard onto the field of combat (for +25 pts). The standard bearer cannot take any magical items if he chooses a magical standard (which can be of any points cost). The Battle Standard Bearer cannot be the army's General even if he has the highest leadership.